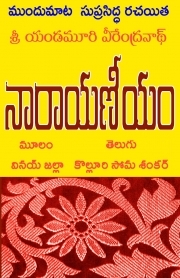 'Narayaneeyam' has been translated into Telugu from the original English version – ‘Warp and Weft’. The foreword is written by one of India's most-loved and celebrated Telugu novelist Yandamoori Veerendranath. Narayana, the protagonist, is orphaned at an early age. He is looked after by his aunt. His aunt dies due to an illness, making Narayana homeless. He wanders on the streets of Zarivaram like a vagrant looking for something to eat. He cannot escape from poverty, which sticks to him like a leech. When drought strikes his village, he witnesses people dying in hordes in front of his eyes. Death brings a new reality; he begins to see life differently. He is shocked to see the Silk Street people untouched by the calamity – they seem to be selfishly enjoying the pleasures that money brings with it. He observes how destiny changes the fortunes of rich people. He makes a selfish pledge to himself: to earn money and become the richest person in his village. He ruminates a lot, patiently listens to astrologers, wise men and fools too. He strives to achieve the impossible. Will fortune favour Narayana? Vinay Jalla is a web content developer, writer and a graphic designer with over 15 years' experience in print, online and broadcast media. He has worked as a web editor, writer, broadcast journalist at the BBC, web-content developer, graphic designer and as a cartoonist, both in India and in the UK.